Since I started writing this column, I’ve had unprecedented access to all parts of the PropTech value chain. I have spoken to startups and VCs hailing from all over the world, and had the opportunity to delve deep in specific use cases as well as highlight global macro trends. But there was one piece of the PropTech puzzle missing – the customer. Naturally, the true end users of real estate (and of the tech and services that go with it) are people like you and I. However, a significant part of PropTech’s success (or failure) sits with the real estate companies that choose to embrace it (or not). So, for a new series of articles (#CEOTalks), I will be sitting down with real estate CEOs to discuss the hows and whys of their tech forays. Guy Grainger: One of the great benefits to our business and our clients that can come from engaging with PropTech firms is that, thanks to our large global platform, we can scale solutions fast. Startups, on the other hand, tend to be more agile than us, but have issues with scale. By partnering with them, we achieve a strong win-win: we get their speed, they get our scale. Within this guiding principle, we have two predominant areas of focus. The first is to speed up processes and create a more frictionless service, and the second is to create new and more integrated products. On the service side, we have come to the realisation that that there is a lot of workflow in what we do, and that many processes can be automated out, enabling faster decisions. For example, our partnership with Leverton allows us to provide a more accurate and quicker lease analysis service than we could otherwise give. Per my earlier point, we benefit from the increased speed whereas access to our data allows Leverton to improve its product. The product landscape is enormous and growing on a daily basis. We established JLL Spark as part of JLL’s broader “buy, build, partner, integrate” digital strategy. It is not just an investment vehicle. Through JLL Spark we make strategic investments but it is also a partnership with proptech startups. Unlike typical corporate venture capital, JLL Spark is a relatively independent division with autonomy over its investment decisions so that it pushes the broader JLL organisation to be a technology-first business and build on JLL’s existing technology capabilities. We want to find solutions that we like for ourselves and our clients, and then want to put our money where our mouths are. For example, JLL Spark invested in VergeSense a few months ago, and we’ve deployed its AI powered sensors in our London headquarters so we can track and maxisimise how we use our office space. Grainger: Naturally, some areas will require more time to innovate than others, but these are the main ones we are interested in. We think tech will significantly disrupt the utilization of buildings, especially thanks to IoT and predictive maintenance. Human experience based services will become ever more significant; as commercial real estate edges closer to becoming a consumer business, it won’t matter whether the asset is a hotel, an office building, a mall or an apartment block – individuals will want all the same things such as access to information, clean air, connectivity and more. Some startups such as HqO are already creating this link between the building and the user, by helping landlords create better experiences and amenities for tenants. One area I think is going to be huge is valuations, where big data and local market information are used for a more accurate analysis of future growth. JLL Spark recently invested into Skyline AI, which uses machine learning and predictive modelling to identify commercial assets with potential for future growth. Looking further into the future, I think that tech can transform real estate transactions, by unitising real estate and bringing liquidity into the market, but this will take time to come into effect. On the topic of real estate transactions, JLL Spark’s investment into Hubble marked the first time that we invested in a disruptive business model. As an online platform for flexible office space, Hubble could be seen as a competitor to our existing business. The rationale behind this was that, if we are going to be disrupted, we want to learn from it and grow together. Hubble works closely with the JLL Flex Space team, passing leads back and forth depending on which team is better suited for the client. For us, it’s not just about returns on investment. We have a strong enough balance sheet that we can invest on building a more resilient business model and attracting a workforce interested in the future not just the present. Grainger: Some things will move faster than others. Single product solutions, such as the ones offered by the largest flex space operators, have been an eye opener for providers such as ourselves that historically tried to offer our clients very localised and bespoke products. However, you still need to get the balance right, as the product has to stand the test of time. Again, as the way we value property doesn’t change much from place to place, I would expect that to be automated and standardised at some point, though that will take time. I believe that, in the next five years, we will expect information on our mobile on experiences and services for every building and space we access, and community links will be ever more important. 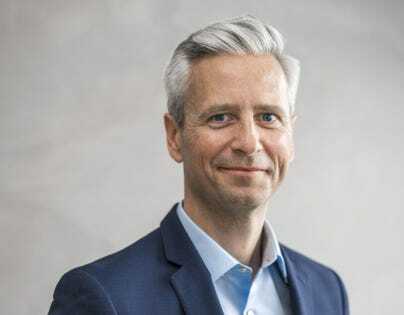 Guy Grainger is CEO for EMEA at JLL. After earning a degree in valuation and estate management, he started off professionally at a retail-property company in 1989, and continued working in the sector for two decades. Guy joined JLL as the head of UK retail in 2008 as part of a corporate acquisition. In 2013, Guy became CEO of the UK business. He took on his current role leading the EMEA region in 2016.